Vanity of vanities! An exercise in banality. It ends a bit gruesomely this one. Severed heads and limbs were just some of the studies Gericault painted in preparation for his masterpiece “The Raft of Medusa”. Andy Warhol made pictures of soup cans which also shocked people. I’m not squeamish though. I once opened a can of Campbell’s soup without gagging. You’re either born with the warrior spirit or you’re not. 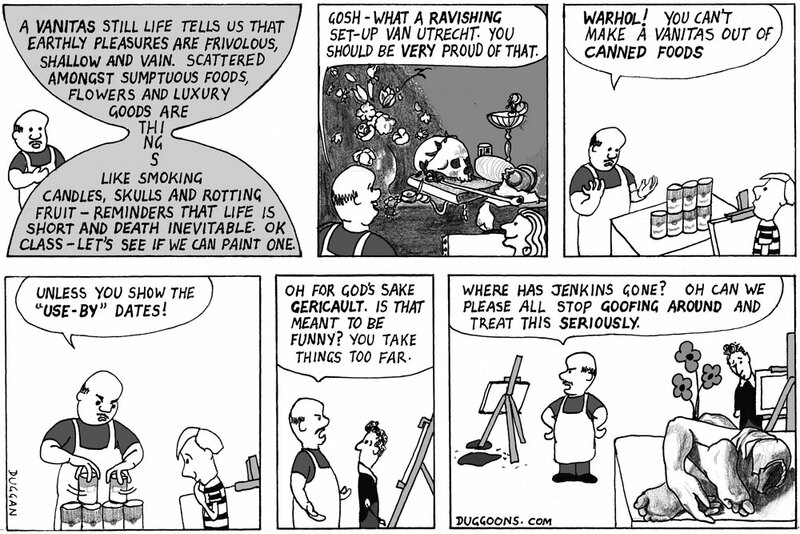 An attentive sub-editor asked me if the name Jenkins referred to a real artist. No. I was just after a common, unflamboyant surname. If I’d said Van Jenkins you could be sure you could be sure there’d be a poncey artist on the end of it. I’m a little annoyed at myself with this one. I often like a few ideas in my cartoons, and am quite partial to a bit of a narrative, but with this one I changed my mind about some things at the last minute and made it wordier – a cardinal sin. I was so annoyed with myself that for the next couple of months I only drew single or double panel cartoons, which is probably a good thing. Or is it? if you have a strong opinion on the matter I’d love to hear it (and perhaps act on it). Is it an immediate turn-off to see a multi-panelled cartoon? Do you enjoy going a bit more in-depth with an idea or prefer a quick hit? Or do you enjoy leaving me hanging, my hand hovering in the air for a high five as you walk away, sniggering at the publicly embarrassing position you have left me in?